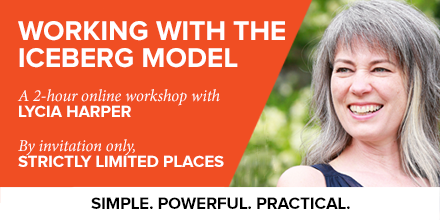 Online workshop: What is the Iceberg Model? Get practical ways to use the Iceberg Model. Think Systemically. Get Confident. Prototype Ideas for Change. The iceberg model is a simple, powerful and practical tool for working with complexity and thinking about change. It helps you to find team dynamics you can’t see allowing you to break your team’s old habits. Applying the Iceberg Model enables you to gain clarity of what is hidden below surface level conversation and passive aggressive emails. You gain the insight to truly align your team. …your gut tells you that you need to do something that feels radically different to your team. This workshop will look at complexity in an organisational context. We will learn what influences and drives behaviour and the outcomes we experience. We will examine how change happens (and how it can be resisted) and most importantly, use the iceberg model to explore complex situations and how we can intervene. An engaging, participative and practical online workshop that focuses on how we can take practical action. Participants will share insights and learning to develop our shared understanding of complexity in a range of contexts. The Iceberg Model is used to make sense of what we see and what we don’t see in our own workplace. You will experience a new way of working that acknowledges the relational and interconnected nature of our organisations and communities. Knowing how you and your teams can use the iceberg model in practice. New insight into the workings of your organisation and practical ways to navigate through complexity. A bigger network of support and resource. Lycia Harper is a complex systems practitioner. She gives people practical, accessible ways to think and act systemically i.e. take a ‘whole system’ approach. 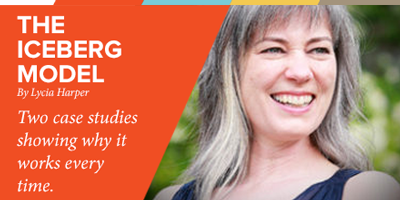 Her work based on the science of how human systems work, evolve and flourish. These practices help them to navigate through complexity for sustainable change. Lycia works with not-for-profits, civil society and corporate organisations. Pete Masters has thousands of hours of experience in interactive online facilitation. He knows how to make people welcome in a virtual environment. Drawing from 10 years of experience working in digital marketing and operations in startups, small business and leadership and development, including six years working in next-stage organisations (i.e. not hierarchical), his mission is to embed learning using digital tools.